Australian scientist/conservationist/explorer Flannery (The Weather Makers, 2006, etc.) 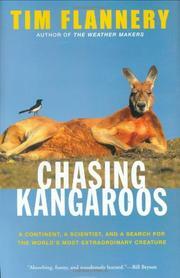 tells the remarkable story of underappreciated marsupials thriving Down Under. “They are, in my opinion, the most remarkable animals that ever lived, and the truest expression of my country,” he writes. Flannery has been fascinated by kangaroos ever since he abandoned prospects for a humanities degree in favor of work for a noted paleontologist and a cross-country summer trip on a sturdy motorbike some 30 years ago. Not only did these untamed youthful adventures excite his interest in further fieldwork, they also provide the frame here for lively chapters filled with colorful Australian characters and occasionally perilous encounters with the continent’s scattered Aborigine population. The author provides assorted factoids related to the kangaroo’s feet, jawbones, daily diet and reproductive cycles (certain pregnancies average 33 days) that will spark even the most casual reader’s curiosity. The larger species—the lean, resilient red, the speedy grey, the fiercely self-sufficient euro—get most of his attention as he rambles through the outback to uncover the genesis and evolution (affected by climatic changes) of what was originally labeled a “giant leaping rat.” The scientific scrutiny of experts like James Cook, who examined breeding habits, and Terrence Dawson, who unlocked the “deep mysteries of hopping,” fueled Flannery’s ever-expanding personal interest in kangaroos. He offers an update on the current condition of kangaroo culture and its significance to the country’s delicate ecosystem. His final notes are cautionary, urging Australians to take a more educated interest in the land they inhabit and the exquisite creatures who dwell among them in more than 70 species. Quite exhaustive, fired by a boundless exuberance that leaps off the page.